Mop-Up Duty was founded in early-2006 by four very nerdy baseball friends. Often we would get together and share what nerdy baseball things we had be researching and reading about, and we’d part ways wanting to know more. We’d pepper each other with questions. 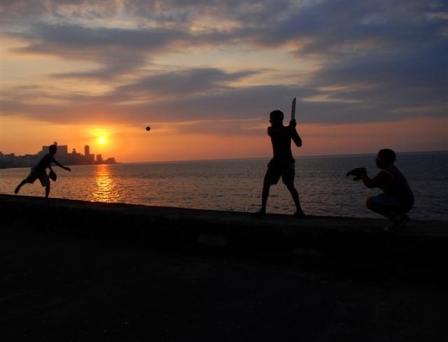 What was it like to see the Toronto Maple Leafs and Havana Cuba Sugar Kings play in their day? What kind of prospect does Travis Snider look like after his first minor league season? What was your trip to Fenway Park like? Who is this player from Cuba that no one has heard of? So, we started answering those questions in short posts and lengthier articles. They were really just for us to share stories, research, and experiences among ourselves and a small group of friends. Eventually, more people started reading and participating in the discussion. Then more, and more, and more, and more. Eventually we became affiliated with theScore.com’s Sports Federation. We narrowed our writing focus to the Toronto Blue Jays, a team we all share an affinity for. When theScore’s Sports Federation disbanded, we partnered with ESPN’s SweetSpot as the official SweetSpot blog for the Toronto Blue Jays. Yet, somewhere along the way… we lost our way. We began writing for our new extensive audience and not for ourselves. We would mail-in a post just for the sake of having fresh content. We would say things for the sake of having something to say, not because our hearts were in it. And we were getting a little burnt out. After a three-year hiatus, we’re nearly back to what we used to be. Admittedly, we don’t have the same free time to commit to following our nerdy pursuits as we did 12 years ago, we’ll still make an effort to check in every once in a while. We still love the Blue Jays, but we won’t limit ourselves to talking only about Blue Jays-related topics. Though the Blue Jays are “our team,” we aren’t here to summarize every game that the team plays. The Blue Jays are fortunate enough to have a plethora of top quality writers who cover them: John Lott, Kaitlyn McGrath, Laura Armstrong, Richard Griffin, Jeff Blair, Mark Zwolinski, Cathal Kelly, Ken Fidlin, Robert MacLeod, and Nick Ashbourne all do a great job. If you follow us on Twitter, we’ll link you to all of the best articles. But we won’t copy & paste them into a post of our own, or regurgitate it with slightly different wording and pass it off as something meaningful. Most importantly, we’re not going to be the 23rd voice in the blogosphere that tells you Troy Tulowitzki is having surgery, nor will we post the lineup of every game. That sort of information is easily accessible from mainstream news sites. Will will, however, be the only blog that tells you former Blue Jays manager Tim Johnson has been managing in Mexico. We’ll continue to discuss difficult, often polarizing topics, provide spring training coverage when we’re there, profile up-and-coming prospects, human interest stories, and provide commentary on our favourite team as we see fit. Most importantly, we will continue to answer the questions asked by our friends, family, and colleagues – which is how this blog got started in the first place. We write about the stuff we want to read about. While we may touch on some obscure subject matter from time to time, I’d like to think that our posts have brought back special memories for more than a few readers, perhaps inspiring them to have a rejuvenated interest in baseball. We blog because it keeps us engaged in the practice of writing and because we harbour a hope that what we write here reveals a perspective or insight that many fans don’t see. Blogging also keeps us connected. People we’ve never met tell us that Mop-Up Duty contains some of the best writing on baseball they’ve come across. I don’t know about that, but I do know that for me, blogging is about writing as I see it (even if I am wrong twice as many times as I am right) and occasionally illuminating a dark corner or two. What’s important, of course, is not how you found us but that you did. Thank you for finding us and keeping us connected with all of you baseball fanatics. Keep providing us with food for thought about our past and future posts. Of course, if you’d really like to know what we think about Tulowitzki’s surgery, you can always ask us. We’d like to stay connected with you as much as possible. Follow us on Twitter (we’ll “turn-two” and follow you back! ), you can “like us” on Facebook, or contact us individually by clicking on the “Authors” section at the top of the screen. Welcome to Mop-Up Duty. We hope you enjoy your stay.